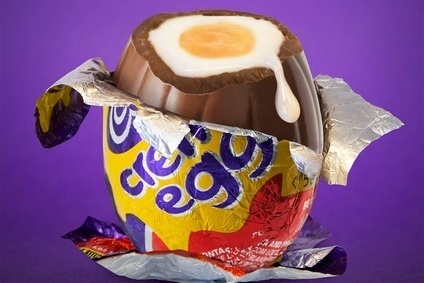 Mondelez International has been accused of "ripping off fans" in the UK after it altered the recipe for its much-loved Cadbury Creme Egg and pulled an egg from the original six-pack. "As you have changed the recipe to cheap chocolate because it's cheaper to make then the price will be cheaper. Right?!" a somewhat rhetorical post on the brand's Facebook page read. "Wrong! The price of five is still the same as the price of six. Not only are they ruining the recipe for this traditional British Easter treat they are ripping off dedicated fans too!" The eggs will no longer use Cadbury's Dairy Milk chocolate, and instead will use "a range of milk chocolate blends," a Mondelez spokesperso told just-food. Mondelez said it "may have used" Cadbury Dairy Milk as the chocolate in its shell in recent years but insisted it has "never flagged it" as a Cadbury Dairy Milk product. "The fundamentals of the Cadbury Creme Egg remain exactly the same - delicious milk chocolate and the unique crème centre that consumers love," the spokesperson said. A decision to remove one of the eggs from the six-pack also annoyed some. "Eggs come in half dozens, not 5s. Even chocolate ones filled with sweet cremey fillingy goodness... Give me back my creme egg!" another Facebook user posted. Mondelez said the number of eggs in a pack had been reduced "owing to a range of economic factors". The spokesperson added: "We have also reduced the recommended retail price but it's the retailers that decide the price at which they sell our eggs to consumers." In this social media age, brand-owners make changes at their peril. Whether, of course, the frustration on Facebook translates into lost sales or is, in fact, froth, remains to be seen.